Student Laura Di Girolamo, a Political Science major from Chile, won an Honorable Mention at Harvard's World Model United Nations, held in Rome on March 14-18. On March 17, students and faculty joined the International Relations Society to discuss the Syrian peace talks at the latest installment of "Pizza and Politics." On Monday, March 14, The Guarini Institute for Public Affairs, along with the JCU Think! Philosophy Club and the Department of History and Humanities, hosted a panel discussion on Alessandro Ferrara’s book The Democratic Horizon. The JCU International Affairs Society welcomed political science professors Jackie Norris and Diane Maye for a discussion of the results of the March 1 presidential primaries. The conference provided a platform for discussion between students and young experts regarding the challanges and solutions to issues such as agriculture and world hunger. 75 students, each representing an assigned state, came from schools all across Rome and the surrounding areas. On February 1, 2016, the JCU International Relations Society welcomed the Pakistani Ambassador to Italy, Nadeem Riyaz, to speak about Pakistan’s foreign policy and challenges for the future. "Pizza and Politics" is a monthly series organized by Professor Michael Driessen, that aims to bring students and professors together for enlightened conversation about pressing, contemporary, global political events. On October 7-8, 2015, JCU alumna Diletta Luminari represented Italy in the annual G(irls)20 Summit in Istanbul. Modeled after the Group of 20 international forum, G(irls)20 is a widely recognized platform for young women's empowerment. 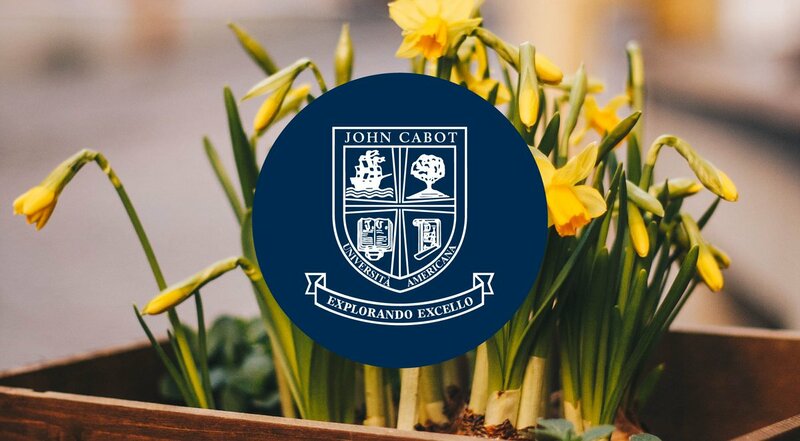 On November 9th 2015, John Cabot University hosted a Community Service Forum with speakers from the United Nations Women's Guild (UNWG) Rome. The International Relations Society hosted a panel discussion on 'The Refugee Crisis: Perspectives from Eastern Europe". Students will have the opportunity to interact with the Nobel peace laureates and other students delegations from all over the world. A delegation from the JCU Model United Nations (MUN) Society attended the Rome MUN Conference on October 15 at the United Nation's Food and Agriculture Organization. Friday, September 4th, marked the end of the week-long Student Leadership Training sponsored and organized by the Student Services department at JCU.